Your neck feels swollen. You’re sure it must be something with your glands, so you look up “lymph nodes” online only to realize that you’re more confused than before. It all sounds like something out of a medical school textbook! So is it your lymph nodes that are making you feel so terrible and what does it mean to have swollen glands anyhow? We often call lymph nodes glands, which is correct enough, although not perfectly right. The lymph nodes vary in size, but the ones you most often feel are about the size of peas or jelly beans and are located throughout the body. The lymph nodes that seem to swell most often are in the neck, but there are lymph nodes in many places including your armpits and groin. While some lymph nodes can be felt through the skin, others are about the size of a flea. Some of these are all but impossible to feel in the body but some do appear in groups – like those in your neck and underarms. Typically the lymph nodes have no feeling and are not hard or tender. They are just there. The lymph nodes are part of a bigger system in the body called the lymphatic system – this is obviously where lymph nodes get their name. The lymphatic system moves fluid through the body. This lymph fluid contains nutrients and waste materials and moves between the body tissues and blood stream. Your lymph nodes and the bigger system are all part of your immune system – the defenses that keep you from getting sick. Lymph fluid travels around your body using the lymphatic system. As the fluid moves into the lymph nodes, the nodes filter out all of the bad stuff like bacteria and viruses. White blood cells attack the bad things that are caught by the lymph node filters and ultimately the bad stuff is destroyed and you stay healthy. The glands behind the ears are the most common to swell. If you feel like the lymph nodes directly behind your ears on your neck feel swollen and hard, it may simply be due to a cold that you’re struggling with or perhaps a sore throat. An insect bite near a lymph node can cause swelling as well, and a cut or other small injury can have the same effect. In the armpit, the lymph nodes can swell due to an injury not just to the armpit, but to any location along the arm or even the hand. In much the same way, an injury or infection on your leg or food may cause the large cluster of lymph nodes in the groin to swell. Of course, in the case of injury or illness, the glands closest to the actual problem will become swollen. It’s unlikely that the lymph nodes in your groin will be become swollen when you’re dealing with a sore throat for example. While there are many common reasons for lymph nodes to swell, there are more serious, less common reasons as well. In the case of a cold or injury, the nodes will stop swelling as your condition improves, returning to normal on their own. Other, more serious conditions may mean more medical attention is necessary to solve the swelling of your nodes. In most cases, if you have only one affected area of swelling. Your neck’s lymph nodes for example, may swell if you are likely experiencing a minor, common condition. The swelling will be reduced in a few days or perhaps a week. In more serious conditions, the swelling in your lymph nodes may persist well past one week – possibly for months. If this is the case, it may be that the swelling in a single area is indicative of a tumor. This may be a benign tumor, or it may be cause for concern as swelling in a particular area can be a symptom of certain types of cancer. Prolonged swelling in the groin’s lymph nodes, for example, can be a sign of testicular cancer or lymphoma. Mononucleosis or “the kissing disease” which can make you incapacitated for weeks with fatigue and fever. Bacterial illnesses such as Lyme disease, which is carried by ticks, or a strep throat. HIV or AIDS, both of which attack the immune system including the lymph nodes. The side effects of certain prescribed medications including phenytoin and the measles-mumps-rubella (MMR) vaccine. If you have reason to suspect your swollen lymph nodes may be due to one of these causes, especially if they remain swollen for more than just a few days, please seek the advice of a doctor. Treating swollen lymph nodes sounds simple enough – you just treat the problem that’s causing the swelling. If you have a cold that is causing your neck’s lymph nodes to swell, you treat the symptoms of the cold including the drainage and sore throat, and the lymph nodes will gradually reduce in size and return to a normal state. If you have a more serious illness causing the swelling, you may need help to treat the cause. For example, a bacterial infection like strep will need antibiotics. A viral infection will likely go away on its own, but the infection may be speeding along its way with certain medications. Swollen lymph nodes that are caused by injuries or infections will simply need to run the course of the injury or wait until the infection has been treated properly. In the vast majority of cases, swollen lymph nodes will reduce in size gradually until they are normal again and no longer a concern, although the swelling may last longer than the cold or injury. This is true for lymph nodes that are swollen and tender and those that are simply swollen and hard without hurting. If you have lymph nodes that are swollen in multiple areas it may be that a virus or medicinal side effect simply has to run its course before the swelling reduces normally. However, if you have one more areas affected by swollen lymph nodes and the symptoms of the swelling are getting worse instead of better, or you are not seeing any reduction in swelling after a few weeks, it may be necessary to have the area tested. There are two possible tests that may be used at your doctor’s office to evaluate swollen lymph nodes. The first is a blood test which will show signs of certain diseases or conditions that may be causing your lymph nodes to swell. The second test is a form of biopsy to test the contents of the swollen node. A biopsy (Lymph node biopsy – Harvard Health Publications ) is a procedure that removes a small amount of lymph node tissue. The tissue that is removed is placed on a slide and examined under a microscope for infections or more serious conditions like cancer. Other tests may be performed on the tissue as well. These processes may include genetic tests, cultures for certain diseases and tests to determine if an autoimmune disorder like HIV or AIDS is present. Fine-needle biopsy – The fine-needle biopsy is the opposite of a shot. The doctor uses a thin needle to pull material out of your lymph node rather than putting medicine into your body. The needle size is roughly the same. Core-needle biopsy – In a core-needle biopsy, the doctor removes a larger sample of tissue using a special needle. This needle is wider and has a special tip. When inserted, it removes a tissue sample that is about the size of a grain of rice. Surgical biopsy – If a larger sample is needed, your doctor may perform a small surgical procedure to remove a nymph lode for testing. This is called an open, or surgical, biopsy. 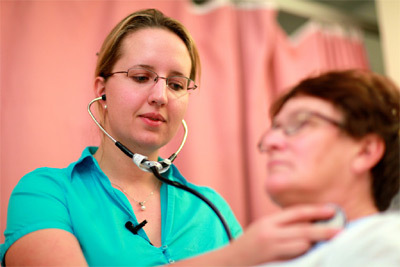 In some cases, the doctor may remove more than one lymph node from the same area at a given time. This is called a lymph dissection, but is essentially the same procedure. In the case of the fine-needle or core-needle biopsy, you can expect the procedure to be done using a local anesthetic and there is no need to plan for any downtime following the surgery. In both cases, the surgeon will numb the area where the biopsy is to be performed. The needle is inserted and removed once the area is prepared. After the needle is removed, a bandage is applied and the process is complete. The full biopsy procedure in these cases can take anywhere from five to twenty minutes. In the case of the open, or surgical, biopsy, you may have either general anesthesia or a local anesthesia depending on the location of the nymph lode to be biopsied. The closer the node to the skin, the fewer anesthesias will be used. If multiple lymph nodes are to be removed, or the nodes are in a complicated area, general anesthesia will be used and the process will be more complex. 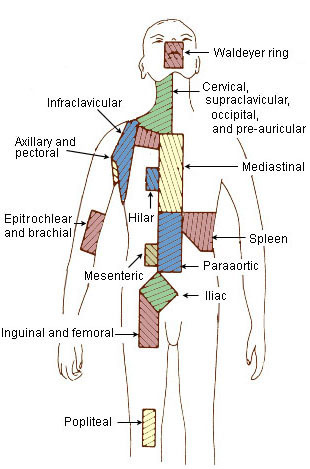 In both cases, the area of the surgery is prepared, an incision made and the section or total lymph node is removed. Stitches are used to close the incision again and the surgery is considered complete. The full process usually takes less than an hour. The results of your biopsy will tell you and your doctor how to proceed with additional treatments. While your lymphatic system isn’t one you can easily improve with a treadmill and free weights, there are ways to keep your lymph nodes and connecting vessels healthy and well-functioning. First you must understand that the lymphatic system is almost like a second circulatory system (Raw Food For Health: Flirting with The Lymph Swollen Lymph Nodes And What To Do About It! ). Your blood vessels run all around your body and use the heart to pump the blood. Your lymphatic system runs right along with all of those blood vessels, but it doesn’t connect to the heart. Instead, the movement of your diaphragm – the muscle you use to breathe – keeps the fluid moving along the lymphatic vessels and into the lymph nodes. Breathe deeply. The best thing you can do for your lymph nodes is to keep the diaphragm moving well to encourage regular movement of the fluids through the system. Take deep breaths that make your stomach move – that is the diaphragm working. Consider meditation, relaxation sessions and even yoga to improve your deep breathing techniques. Belly laughs can also give your diaphragm a good workout – laugh until your belly hurts and you’ll know you’ve moved lots of cleansing fluids through the system. Keep moving. You don’t have to measure your heart rate to check your lymph node’s hard work, but the vessels that connect and clean the lymph nodes are enmeshed with the biggest muscles in your body – your legs and arms. The more you move your muscles, the more the lymphatic system works to clean your cells and your nodes. Enjoy a healthy lifestyle and diet. Your lymph nodes and the lymphatic system cleanse waste from cells. The less waste there is to clean, the healthier all of your body systems will be. Life a healthy lifestyle and eat foods that help your heart and blood vessels. Since the vessels of the lymph nodes run alongside the heart’s vessels, a diet low in cholesterol will help keep all of the vessels flexible and working properly.